CMI’s programme is focused on making meaningful contributions to peace processes in three regions – the Middle East and North Africa, Eurasia and Sub-Saharan Africa. A strong focus on women’s participation and gender-specific aspects of conflict is extensively integrated into all parts of CMI work. Today’s violent conflicts tend to be highly complex. They have wide regional impact and involve multiple actors and a diverse array of political interests. In such conflicts, unofficial conflict resolution actors like CMI have some important advantages over official bodies. Independent organisations bring to the negotiating table not only their own wealth of experience and expertise, but also opportunities that are not always open to state-related bodies. And as an independent, conflict resolution organisation with Finnish origins, CMI has the added benefit of being truly impartial and without a power agenda of its own and is thus able to work in the most challenging regions in the world. Each context and conflict is unique – they involve different factors, actors and dynamics. Similarly processes to resolve them are also unique. The Arab Spring of 2011 might seem long gone, but its legacy continues to reshape the politics of the Middle East and North Africa in many ways. In addition to having been one of the underlying drivers of the 2011 uprisings, the inability of Middle Eastern and North African states to decisively tackle ongoing challenges and to accept and implement critical reforms has contributed to undermining the stability of many societies. CMI works in the Middle East and North Africa to foster inclusive dialogue and to support and complement nationally-led peace efforts. We believe that the region’s underlying challenges can be only solved if all the relevant actors are genuinely included in developing and implementing local and sustainable solutions. CMI’s added value is in its ability to facilitate, enable and support unofficial dialogue together with local actors. Despite continuing change in the political environment, we believe it is possible for peacemaking processes to proceed steadily for a more stable and equitable overall outcome. 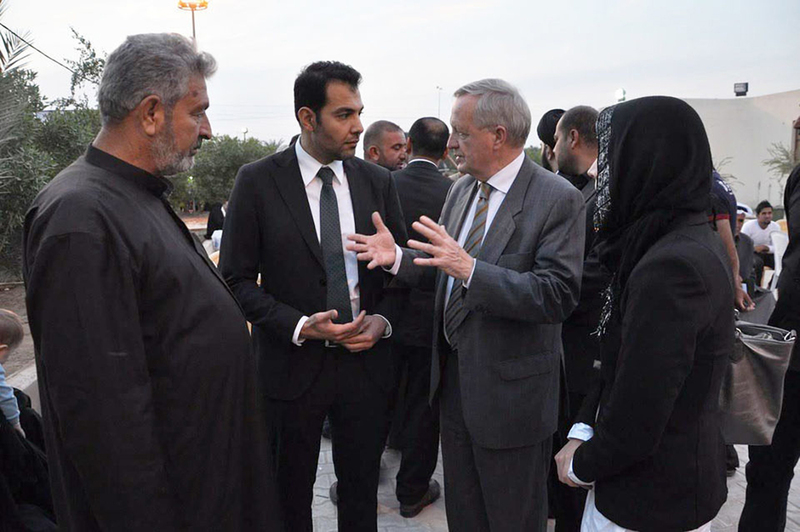 CMI supports national reconciliation efforts in Iraq by facilitating informal dialogue and providing expert support. CMI’s Project Manager Hussein Al-Taee, Senior Adviser Ilkka Uusitalo and Project manager Saana Keskitalo in Iraq. CMI’s work in Iraq is focused on supporting local efforts towards reconciliation through informal dialogue and expert support. The violence and instability in Iraq are rooted in deeper political struggles within society. 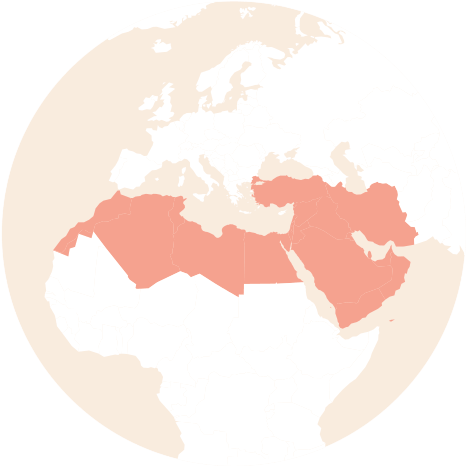 The protracted sectarian conflicts stem from historical grievances, foreign interventions, and past policy decisions. Lack of effective agreement on fundamental concerns risks prolonging instability and violence by causing increased marginalisation and discord within the political system. However, there is now widespread acknowledgement at all levels of Iraqi society that these obstacles must be tackled vigorously and inclusively. CMI’s work in Iraq is focused on supporting local efforts towards reconciliation, peace and stability through informal dialogue and expert support. CMI’s independent and impartial nature, and our focus on supporting local efforts without imposing an agenda of our own, enables us to work with all relevant Iraqi parties. As a result, we have been able to foster trusting relationships with political actors from across the political spectrum in Iraq. CMI’s work remains resolutely independent of all official talks and contacts and is based on the primacy of local ownership. In our work we highlight the importance of Iraqis setting their own agenda, visions and strategies, while we provide the space and opportunity to hold constructive discussions and offer expert advice, where this is considered useful by the actors involved. CMI remains accessible to all the relevant actors at every step of the informal dialogues, thereby helping to ensure the best possible convergence between the various unofficial efforts to bring about a peaceful and prosperous Iraq. CMI facilitates national- and local-level dialogue in order to support efforts towards peace in Libya. CMI has held nation-wide consultations with various stakeholders throughout Libya. Since the fall of the Gaddafi regime in 2011, Libya’s political actors have failed to establish a new, inclusive order. Libyan society continues to suffer from the country’s severe fragmentation of power and political polarization, with a proliferation of armed groups. Political divides are shaped by regional, ideological, economic and societal cleavages. Elites that prospered under the Gaddafi regime and new, post-revolutionary elites continue to fight for political power and resources. To support an inclusive and peaceful transition process in Libya, CMI facilitates national- and local-level dialogue among the relevant stakeholders, including political parties, civil society organization and tribal entities to jointly tackle the root causes of tension and conflict. Over the coming years CMI will continue to create spaces for encountering and communication to various stakeholders, in order to enhance mutual trust and help overcome the persisting divisions between the country’s political and social groups. CMI together with its local partner supports efforts towards Palestinian reconciliation. Palestinian reconciliation can support the democratic development of Palestinian society, and in the long run also contribute greatly to peace and security throughout the Middle East. Palestinian politics and society remain divided despite several agreements between rival groups. 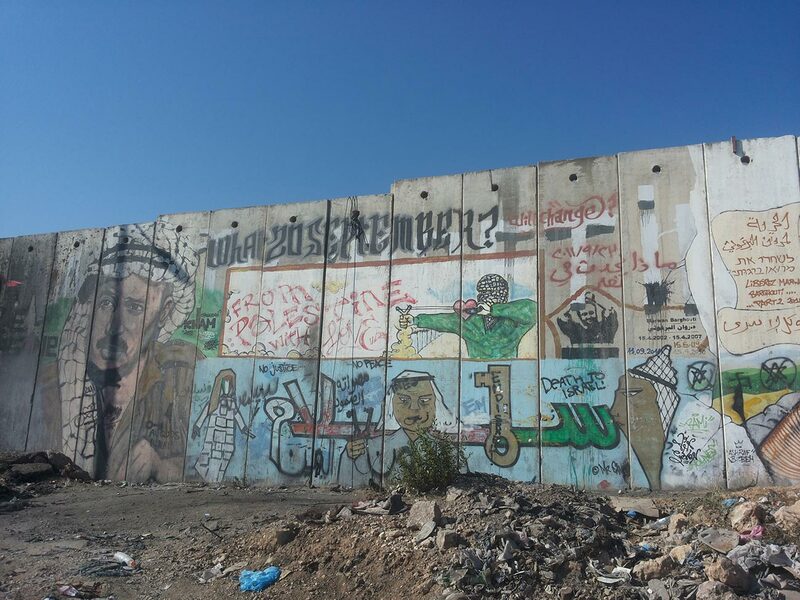 Internal struggles have made it increasingly difficult for broader Palestinian society to be part of the political process. Internal division hinders democratic development in Palestinian society, with seriously harmful consequences for the entire population. Since 2010, CMI and its local partner Masarat have supported the national reconciliation process in Palestine. We work to bring together in informal dialogue a wide group of Palestinian actors from Gaza, the West Bank, the Palestinian community in Israel, and Palestinian diaspora. With this effort we aim to create mutual trust, and develop broadly acceptable solutions on fundamental challenges that have been overshadowed and left unresolved by internal discord and power struggles. The advantage of informal dialogue is also that all relevant actors can continue to meet and discuss together even when formal processes become stalled. The project has so far created trust between the Palestinian stakeholders and established a wide network of actors motivated to support the Palestinian reconciliation. The dialogue has resulted in a number of concrete proposals that have been widely presented to various Palestinian actors and to the official mediator Egypt. Palestinian reconciliation can support the democratic development of Palestinian society, and in the long run also contribute greatly to peace and security throughout the Middle East. CMI facilitates informal dialogue among all key Yemeni constituencies on critical national questions. CMI works to enhance women’s meaningful inclusion in conflict resolution and peacemaking efforts in Yemen. After the first promising three years of transition, Yemen spiralled into a complex conflict that has brought the political process in the country to a halt and created a severe humanitarian crisis. Much work remains to be done to build foundations for a peaceful, inclusive society. The solutions developed at the 2013-2014 National Dialogue Conference in Sana’a are broadly accepted by Yemeni society, but their implementation cannot succeed as long as widespread violence continues. In this context, CMI facilitates informal dialogue among all key Yemeni constituencies on critical national questions. This enables entities from across the political spectrum to build mutual trust and develop joint solutions to the key issues for peace and stability in the country. We also work to enhance women’s meaningful inclusion in conflict resolution and peacemaking efforts in Yemen. CMI supports the Women’s Forum for Dialogue and Peace, an inclusive group of influential Yemeni women who aim to ensure that women’s views and needs are given weight in all negotiations to steer the country’s future in a better direction. For over a decade, CMI has worked to contribute to a peaceful future in Eastern Europe, the South Caucasus and Central Asia. We support ongoing peace processes in the region by engaging with national, regional and international stakeholders, both state and non-state actors. Our efforts help enable dialogue and enhance good governance in societies facing challenging political transitions and, at times, violent conflicts. Strengthening local, national and regional conflict resolution capacities are at the core of our support strategies. We also seek to open and maintain stable channels of communication and to build confidence across conflicts divides, principally in an informal manner, in the post-Soviet space and beyond. In doing so, CMI engages regularly with regional and international organizations including the European Union and the Organization for Security and Co-operation in Europe. CMI’s experience in the region, commitment to long-term engagement, impartiality and Finnish identity uniquely enable us to pursue informal and complementary mediation efforts and to remain honest brokers in support of the most difficult peace processes in the Eurasia region. CMI has supported Ukraine’s peaceful development since 2009, and since 2014 has facilitated high-level expert dialogue between political representatives and other influential public figures. 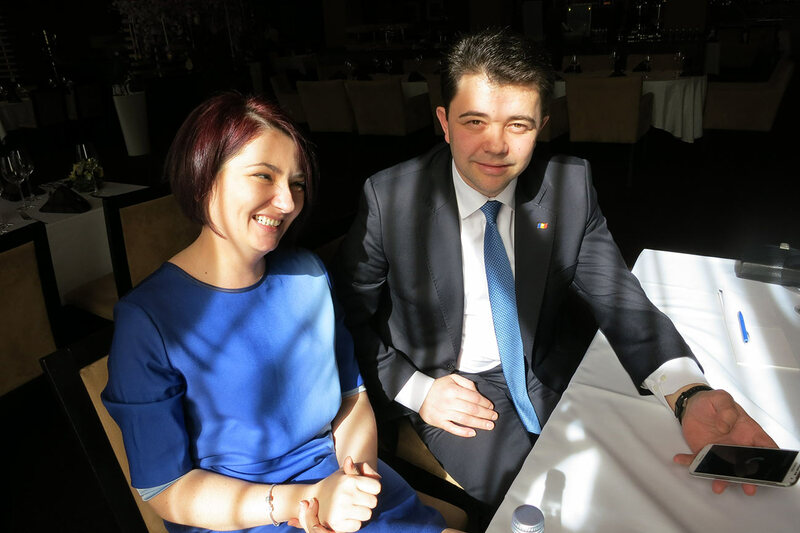 From left to right – Mr. Denis Matveev, Eurasia Programme Adviser, Ms. Roxana Cristescu, Head of the Eurasia Programme and Ms. Irma Pidtepa, Project Officer for the Eurasia Programme. Ukraine remains in the process of transition from its Soviet institutional, economic, and socio-cultural legacy. Before the 2014 escalation of the current crisis phase, little attention was given to supporting and encouraging dialogue between and among elites and the wider society on building a shared vision of how Ukraine can, both as a state and as a nation, develop in the wake of its Soviet past. CMI has supported Ukraine’s expert community since 2009, with a focus on building a network of experts focused on conflict prevention and peacebuilding in the Black Sea Region. In early 2014, CMI began the process of supporting a high-level dialogue between representatives of Ukraine’s political and intellectual elite. In 2015, CMI began convening a regular Ukraine-Russia dialogue platform for influential experts and MPs which now also includes representatives from EU member states, the OSCE and the USA. Starting in October 2016, CMI increased its focus on capacity building for Ukrainian MPs, executives and experts, as well as deepening its cross-sectoral and inter-regional dialogue efforts inside Ukraine. CMI supports Ukrainian actors in strengthening their capacities for effective engagement in the peace process. We work with many official and unofficial stakeholders from Ukrainian civil society and the expert community, and with individuals in the executive and legislative spheres. Within this component of our work we support public activities of the National Platform – Dialogue on Peace and Secure Reintegration. The objective is to ensure the ongoing functioning of a non-partisan, professional and inclusive public platform for supporting the achievement of sustainable peace in Ukraine. The Platform provides a regular, public and professionally moderated space to discuss effective policies for reintegration and ensuring national unity in Ukraine, as well as international experience of building confidence and sustainable peace. From 2015, CMI has worked with Ukrainian negotiators and experts engaged in the official Trilateral Contact Group in Minsk, providing expert support, international expertise and peer exchange opportunities from other peace negotiation processes and on focused topics related to the Donbas peace process. CMI’s Ukraine work is funded through its Programme Partnership with the Ministry for Foreign Affairs of Finland, Federal Department of Foreign Affairs of Switzerland, Irish Government’s Development Cooperation Programme and by corporate donors from Finland’s private sector and by Finnish private philanthropists who comprise CMI’s premium donors group. More information can be found in CMI’s latest Annual Report. CMI supports dialogue across conflict divides and the capacities of government officials in peace mediation efforts. Since 2010, CMI has been working with actors from all sides of the conflict over Nagorno-Karabakh to establish channels of communication and increase confidence between groups of individuals. A difficult process of transition that has continued since the collapse of the Soviet Union has left the South Caucasus deeply fragmented politically. With some of Eurasia’s major energy corridors and competing geopolitical interests, the region has major historical challenges and is also continually confronted with clashing geostrategic options, unstable economic development, and national and regional integration dilemmas. The three South Caucasus countries – Armenia, Azerbaijan and Georgia – have all chosen separate and at times opposing political paths, while trying to tackle severe domestic security and democratic development challenges. Today, national and international actors are still searching for conflict settlement frameworks to address the unresolved statuses of Nagorno-Karabakh, Abkhazia, and South Ossetia. In light of the general instability now stretching from Ukraine to Syria, the illusory convenience of the status quo is no longer an option. The year of 2018 has seen multiple unprecedented developments throughout the region, both representing potential openings of windows of opportunity in terms of moving forward the official peace-processes, but also containing the seeds for a backlash/worsening of the general atmosphere around the non-recognized entities. Therefore, the need is more urgent than ever for reinvigorated peace processes and tackling highly militarized conflicts that have polarized and alienated societies for decades. In a region that has seen human relations deteriorating to a point of almost no return, international mediation efforts and support for official peace negotiations must be complemented with long-term social transformations. CMI has been active in the South Caucasus since 2006, facilitating and bringing discussions about conflict settlement to a broader constituency and enabling otherwise marginalized civil society actors to participate in dialogue and to contribute with suggestions relevant to the official talks. Since 2010, CMI has been working with actors from all sides of the Nagorno-Karabakh conflict to establish channels of communication and increase confidence between groups of individuals isolated or deeply affected by ongoing hostilities or by the lack of progress in official negotiations. CMI has focused its efforts on the generation that grew up in isolation from each other after the 1990s war. This is a generation with very little positive experience of co-existence. More than twenty years of living alongside violence and personal exposure to military action have polarized these young people and profoundly challenged any shared vision they could have of how a potential settlement could be developed. The attitudes of the youth in these areas range from indifference to the conflict and its consequences, to aggression and polarizing nationalist stereotyping. In these circumstances, the chances of broad societal endorsement or support for official compromise grow increasingly slim. 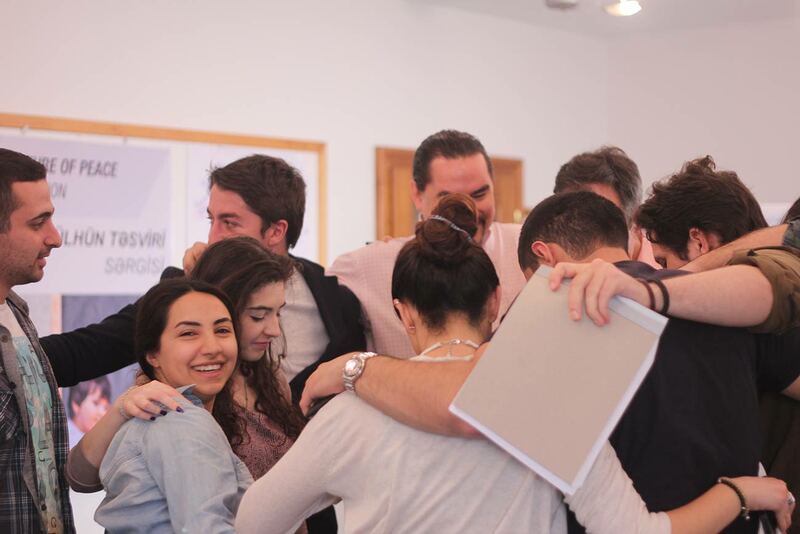 Almost ten years of sustained engagement by CMI, with the support of the European Union (through the European Partnership for the peaceful settlement of the conflict over Nagorno-Karabakh, EPNK) have resulted in the creation of a cross-conflict platform of young professionals from all sides of the conflict divides. The platform’s members are currently mid-level peacebuilding actors working within their respective institutions (including NGOs, mass media, and executive and representative bodies), and strive to be able to come to terms with and positively transform their political and societal environment. Since 2015, CMI has also focused on supporting key actors from official institutions engaged in conflict resolution in Armenia, Azerbaijan and Georgia. This support is designed to enhance peace mediation competences and to enrich the debate on these issues within each of the respective institutional systems. Peace mediation is a very cost-effective means of conflict prevention and peacebuilding, and its value to local and regional peacemaking is widely recognized. Of vital importance to sustainable peace agreements is the ability of state actors and institutions to analyse complex conflict scenarios and explore inclusive pathways for settlements. For the official peace processes in the region to progress, the South Caucasus countries need a broad base of competent and experienced official actors who fully understand the complexities of mediation and peace processes. These actors must be able to provide analyses and recommendations within their institutions, and to the negotiators in the official talks. In 2018, CMI together with partners in the region – NGO “European Integration” in Yerevan, Center of Excellence in EU Studies at the Azerbaijan Diplomatic Academy (ADA) in Baku, the International Centre for Geopolitical Studies (ICGS) in Tbilisi – and with the support of the European Union and the Finnish MFA, worked to help Armenian, Azerbaijani and Georgian officials to learn international best practices from peace processes in Europe and elsewhere. This learning model is now being piloted in other peace processes in the region. An essential element in sustainable peace agreements is the capacity of state actors and institutions to analyse complex conflict scenarios and explore inclusive solutions. CMI provides support in precisely these areas. CMI works to facilitate informal and official dialogue processes between the Parliament of Moldova and Gagauzia’s People’s Assembly to improve mechanisms of center-autonomy relations. 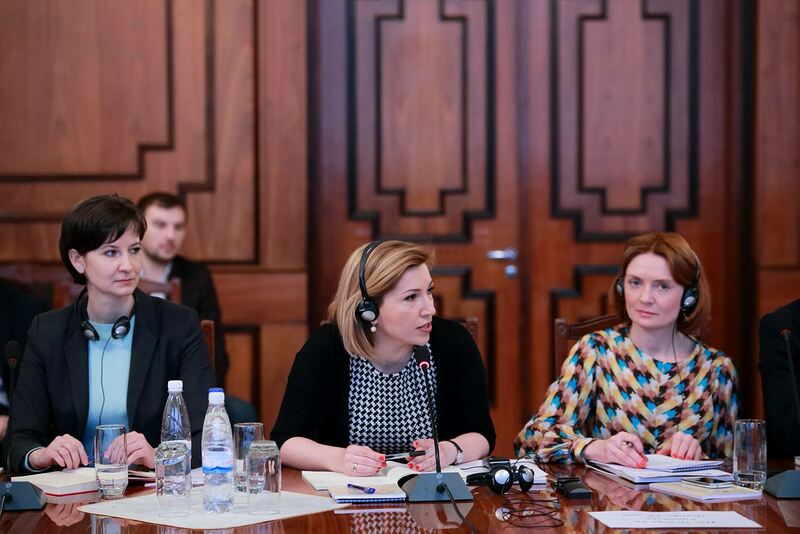 CMI’s Manager Jale Sultanli (centre) and Project Officer Natalia Djandjgava (left) at the first meeting of the official working group on Gagauzia in the Parliament of Moldova in Chisinau. The Gagauz autonomy was established in the south of Moldova in order to safeguard the rights of the Gagauz minority, following a period of unrest in the early 1990s. In 1994, Moldova passed a law on the Special Legal Status of Gagauz Yeri which outlined the structure of the autonomy, including a legislature (the People’s Assembly, consisting of 35 members) and an executive branch, headed by the Governor (the Bashkan). The establishment of the autonomy is seen as a successful conflict resolution model. However, implementation of the 1994 law has been inconsistent, resulting in frequent disputes and becoming a growing source of tension between the central Government and the autonomy. To address these challenges, in 2015, with funding from Sweden, CMI convened an informal dialogue group of legislators from Chisinau (the capital of Moldova) and Comrat (the capital of the autonomy) for sustained joint dialogue to build confidence between both sets of legislators and improve the functioning of the autonomy. Following this initiative, CMI was invited to support the work of the official Gagauzia Working Group (GWG) parliamentary dialogue and decision-making platform, established by the Parliament of Moldova in November 2015 and made up representatives from the Moldovan Parliament and the Gagauzia People’s Assembly. The project works to strengthen the dialogue capacities of key political stakeholders from Chisinau and Comrat and provide them with access to necessary knowledge and tools, enabling them to come together to find joint, politically acceptable but also conceptually sound solutions to pressing issues. CMI uses its international expertise in informal mediation to facilitate the Informal Dialogue Group (IDG), including organizing study visits and capacity building activities, and coordinating input from experts. CMI also provides Good Offices for the Official Gagauzia Working Group (GWG), which is supported and informed by the work of the Informal Dialogue Group. Find here the website of the Project. Project report 2015 – 2018 can be found here. Since 2011 CMI has contributed to efforts towards a peaceful and equitable settlement to the Transdniestrian conflict. Roxana Cristescu, CMI’s head of Eurasia, and Moldova’s former deputy prime minister Victor Osipov continue to seek ways to solve the conflict. The Transdniestrian conflict zone is less than 100 kilometres from the EU’s Eastern borders. Since the war in 1992, the Republic of Moldova and Transdniestria have been engaged on and off in negotiations towards a political solution for the inhabitants on both sides of the River Dniestr/Nistru. The tensions have had a serious impact on the population of both sides and have hampered the whole region’s socio-economic development. Despite years of international mediation efforts, the final settlement of the conflict remains unresolved. CMI’s work in the region includes support to the peace process on multiple levels, focusing on building confidence between the sides, engaging with the sides on key issues where international and local expert support can be of most help and support to the formal settlement process. Since 2011, CMI has worked to support the conflict settlement process by convening and supporting ongoing informal dialogue between high-level independent experts, former diplomats with expertise in the conflict, political analysts, former negotiators in the official settlement processand current advisers to the political leadership in Chisinau and Tiraspol. 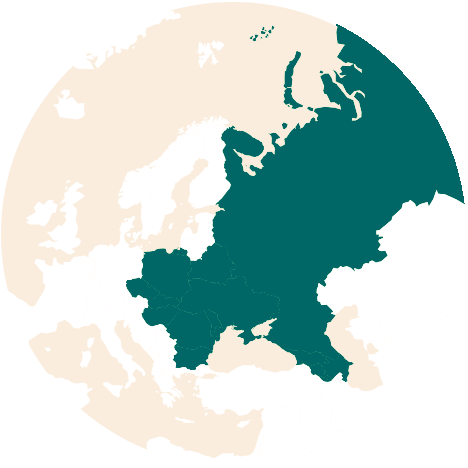 CMI’s dialogue platform members have provided briefings to international actors, directly involved in and influencing the settlement process in Vienna, Brussels, Moscow, Washington, Kyiv, and other key capitals. Since 2017, CMI has facilitated a high-level Track 1 dialogue between the sides on issues of relevance to the confidence building measures and to complement the settlement process. Dialogue platform members haveengaged in regular exchanges on the major short-term and long-term political trends and issues that influence the settlement process. In order to increase connectivity between local, national and international actors, CMI also facilitates regular exchanges between its dialogue platforms and relevant institutions. Over the years, CMI provided tailored support to the international actors bringing dialogue platform participants and locally generated analysis and recommendations to international actors with special focus on the OSCE. CMI engages with Chisinau and Tiraspol on a regular basis, focusing on issues and actors that are most central to the settlement process. 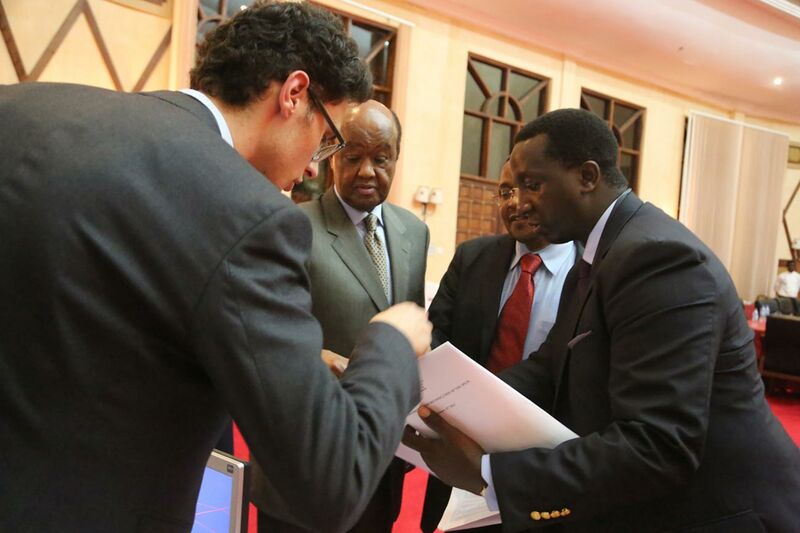 This has led to provision of tailored support to the political negotiators and to Track 1 working groups. CMI also uses these efforts, through facilitating events that create space for informal and open dialogue on sensitive issues, to contribute to the efforts of the negotiators, mediators and observers to find solutions based on compromise. These events make use of relevant international experience, peer exchange events, and lead to the development of analytical materials. Most recently, CMI has also focused on key issues related to the settlement process and providing tailored support to the OSCE chairmanships. Conflicts in Africa are characterized by their regional impact; they are typically transnational and span across national boundaries. In this context, supporting regional approaches to conflict prevention becomes ever more important. 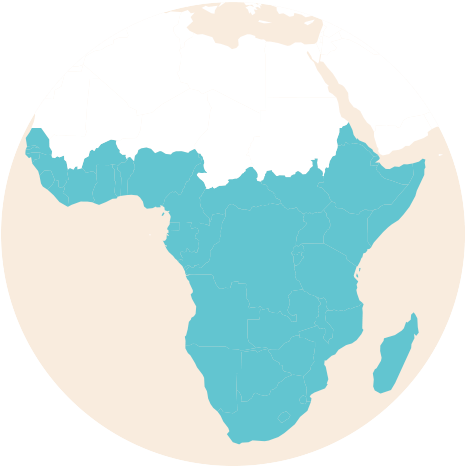 The core principle underlying CMI’s work in Africa is that sustainable solutions to complex, and typically borderless conflicts require regional efforts and the participation of all levels of society. We support the organizations in promoting peace and security on the continent, help them build their mediation capacities, and assist in their mediation efforts. CMI’s work in sub-Saharan Africa involves a number of regional partnerships and collaborations with actors at all levels. 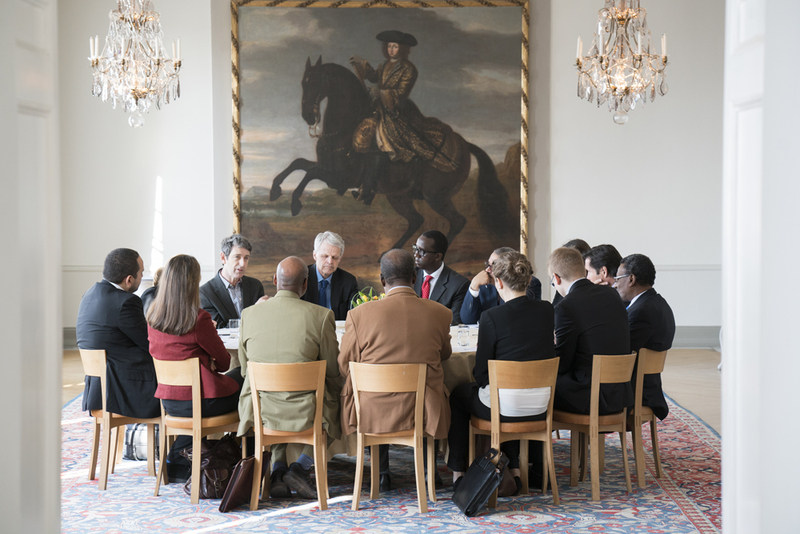 Sub-Saharan Africa and Middle East and North Africa teams discuss regional dimensions of conflicts at an informal meeting at the Swedish mission. CMI works to enhance the capabilities of African national, regional and sub-regional actors, and to provide operational, technical, and advisory support to official and unofficial peace processes, including those in South Sudan and the Central African Republic. CMI works with local and regional actors to identify and enhance the capacities of relevant actors in projects related to conflict analysis, mediation, gender, and inclusion. CMI also creates spaces for constructive dialogue among different actors and helps them address common concerns, such as cross-border security and sub-regional peace. Our work is based on a number of regional partnerships and collaborations with actors at all levels. For instance, at the request of the African Union, CMI has since February 2014 provided operational support to the Economic Community of Central African States (ECCAS) in building its mediation capabilities and strengthening its role in resolving the crisis in the Central African Republic. CMI is also part of a broader consortium that supports the Economic Community of West African States (ECOWAS) in its mediation efforts, in line with ECOWAS’s own conflict prevention framework. The consortium provides high-level peace and security expertise to ECOWAS and aims to strengthen its mediation capabilities within the broader African Peace and Security Architecture. To further support peace and security efforts in the region, CMI has signed a Memorandum of Understanding with the Secretariat of the Intergovernmental Authority on Development (IGAD). CMI has also established cross-regional working groups focused on the Great Lakes Region, the Sahel and the Red Sea in response to evolving political dynamics within these regions. Bringing together the specific regional expertise of CMI, the groups actively monitor the evolving regional dynamics providing good offices and analysis. Pragmatism, light and nature: How Finnish design contributes to peacemaking? CMI’s long-standing work with the African Union is centrally focused on further strengthening collaboration between the Union and the regional economic communities. 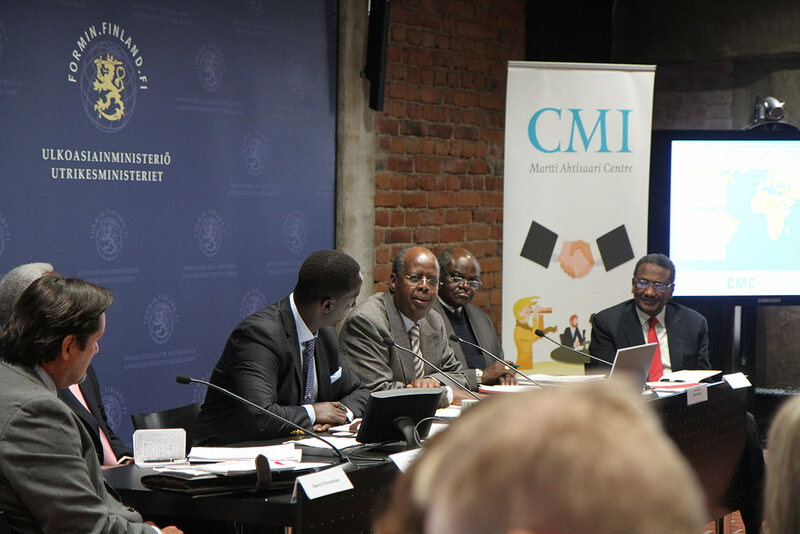 Ambassador Nicolas Bwakira (left) together with CMI’s senior advisers David Kapya and Nureldin Satti discuss peace mediation in Africa at a seminar in Helsinki. One of CMI’s most enduring partnerships is with the African Union, which has a key role in consolidating peace and security in Africa. Since 2009, CMI has worked with the Union’s Peace and Security Department and the African Centre for the Constructive Resolution of Disputes (ACCORD) to improve the AU’s capacity to respond to conflicts through preventive diplomacy and peace mediation. Because the AU works in a diverse and highly complex environment, it is imperative that CMI is flexible in its support of the Union’s activities. We provide the AU with needs-based operational support in contexts where such assistance can make a substantial contribution to the AU’s capacity to design, implement, and support any given mediation process. CMI’s support includes wide-ranging advisory service and other expertise, ranging from process design and facilitation of thematic areas including national dialogue, gender, and inclusion. The fundamental focus of CMI’s work is on systematising, fostering, and solidifying collaboration between the African Union and the African Regional Economic Communities. For example, at the AU’s request CMI has since 2014 provided operational support to the Economic Community of Central African States (ECCAS) to build ECCAS’ mediation capacities and strengthen its role in resolving the crisis in the Central African Republic. CMI’s support for the AU also includes conducting targeted country assessments and providing analytical briefings to various Union bodies. CMI also helps to strengthen coordination between civil society actors and regional and sub-regional organizations. In collaboration with African non-state actors, the AU, and the Regional Economic Communities, CMI has gathered data on the added value of non-state actors in mediation processes, and has produced recommendations for deepening and solidifying collaboration between non-state actors and regional organizations. The current fragile and dynamic transitional context in South Sudan requires careful attention to in order to build resilient institutions. CMI’s head for Sub-Saharan Africa, Itonde Kakoma with Tanzanian president Jakaya Mrisho Kikwete and CCM secretary general Abdulrahman Kinana prior to the signing of the reunification agreement of the South Sudanese ruling party on 21 January in 2015. CMI has been active in South Sudan since its independence in 2011, and has established a reputation as an independent and effective actor there. CMI works to create an environment that supports sustainable and inclusive implementation of the Agreement on the Resolution of the Conflict in South Sudan (ARCISS). The Agreement was signed in August 2015, and was the successful outcome of coalition-building and transformation of key leadership in South Sudan. The current fragile and dynamic transitional context requires attention in order to produce resilient institutions that can withstand the fragile economic and military situation. We engage with key political actors relevant to the peace process towards dialogue and transformation across the political divide and between varying sectors and levels of governance. Existing partnerships with the political party, the Women’s Parliamentary Caucus, and national think tanks provide entries into the national context. Broader CMI partnerships with the African Union and IGAD, as well as strong links to various actors in the international and regional community allow for appropriate sequencing, focus and coordination of CMI efforts within the broader context. Our ongoing initiative with the South Sudan’s Woman’s Parliamentary Caucus models inclusive approaches to the ongoing peace process in South Sudan to wider stakeholders, and is geared to strengthening the role of parliament in conflict resolution, and the implementation of ARCISS specifically. CMI also supported the Sudan People’s Liberation Movement (SPLM) Intra-Party Dialogue alongside the ruling parties of Tanzania (CCM) and South Africa (ANC). The Dialogue convened the principal groups of the SPLM Groups in Arusha, and resulted in the signing of the SPLM Reunification Agreement on January 21, 2015. CMI has since worked with the Co-Guarantors of the Agreement, CCM and ANC, to implement the Reunification Agreement. See our video on our work with female parliamentarians in South Sudan. Women are the largest group affected by violent conflicts and yet systematically excluded from their resolution. This reality is recognized by the international community , but real change on the ground is slow to come. Gender equality and inclusivity are core operating principles of CMI. In our work, we strive to highlight the indispensable role of women in building and sustaining peace, and aim to widen the space for women to participate in peace processes. If we miss out on half of the population in efforts to resolve conflicts, we miss opportunities for a better peace. One of the key principles guiding CMI’s work is inclusivity. Head for Women in Peacemaking, Johanna Poutanen, at the Nordic Women Mediators (NWM) annual meeting in Helsinki. In 2000, the United Nations adopted a ground-breaking Security Council Resolution 1325 on Women, Peace and Security, the first of eight such resolutions recognising women’s rights as indispensable to international peace and security. Despite these normative advances, women and their views are still gravely underrepresented in peace processes worldwide. CMI works to change this reality by supporting women in conflict-affected countries to access and influence peace processes; and by enhancing inclusive and gender-sensitive mediation capacities. Inclusivity is one of CMI’s core operating principles. We highlight the importance of women’s participation in building and sustaining peace, and work to create a greater role for women in peace processes. Concretely, we do this by supporting women from diverse social and political backgrounds in conflict-affected countries to come together and build consensus on the issues that matter to them, and to advance these priorities in conflict resolution processes. For instance, in Libya CMI supports an informal working group of civil society leaders to advance key issues concerning women in the country’s transition to peace and stability. Another way CMI advances inclusivity in conflict resolution is by promoting gender-sensitive mediation. One of our goals is to make it standard practice for gender considerations to be included in all stages of peace processes and subsequent agreements. CMI promotes a nuanced understanding of gender in peace and conflict, and supports mediators in tackling these issues in practice. An important part of our work in this regard is our annual High-Level Seminar on Gender and Inclusive Mediation, organised in partnership with United Nations Department of Political and Peacebuilding Affairs (DPPA) and the Peace Research Institute of Oslo (PRIO). 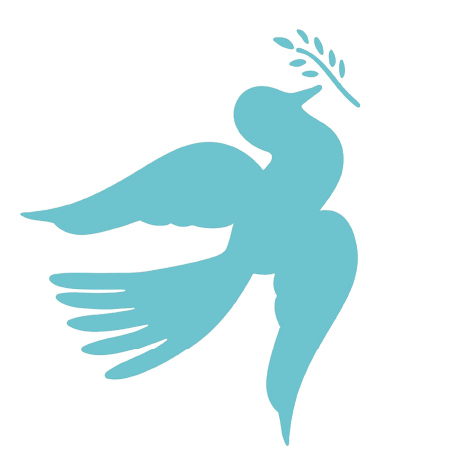 Read our article on debunking the myths about gender in peace mediation here. 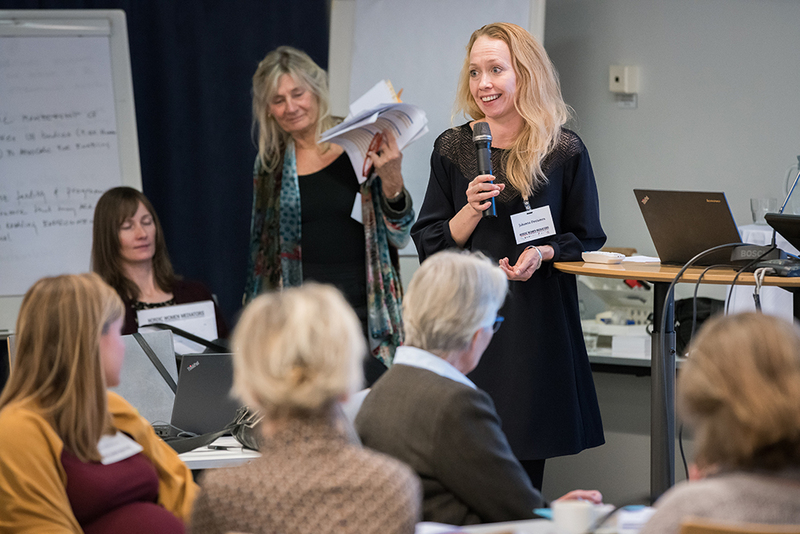 CMI is an operational partner of the Nordic Women Mediators, a growing network of peace and security professionals that aims to advance the inclusion of women at all levels of peace processes from grassroots efforts to high-level negotiations. In this capacity, CMI also supports the collaboration between regional women mediator networks across the globe. These networks play a role in promoting inclusive conflict resolution practices and mobilising support to women in ongoing peace processes. Read more about the network and other partner organisations here. CMI contributes to the development of the field of peace mediation in three ways: i) the cumulative lessons learned from CMI’s experience in different contexts and themes, ii) the expertise and experience of President Ahtisaari as a leading global mediator, and iii) CMI’s partnerships in the international peacemaking community, convening platforms and dialogue with peer organisations, governments, think tanks and international and regional organisations. Within this focus, special effort is made in seeking complementarity with Finnish efforts to support the international peacemaking community, and in seeking innovations for joint development with other actors. CMI’s focus on policy and learning is aimed at creating positive feedback loops between thematic topics identified and informed by CMI’s work and learning from key national, regional, and international actors. These topics are based on CMI’s internal learning mechanisms, centred on internal reviews and critical friend practices, combined with CMI access, networks and analysis. Selected topics are certain to develop further in accordance with local dynamics and emerging trends.